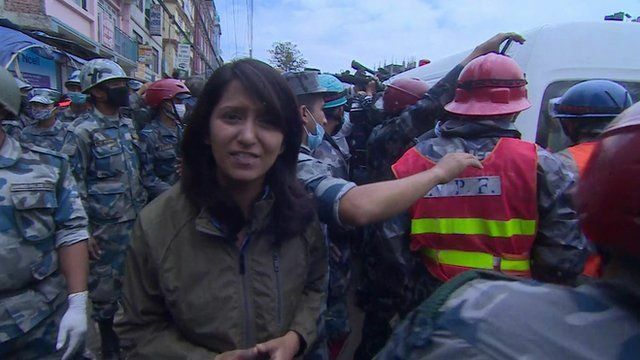 Rescued teen 'heard others screaming' Jump to media player A 15-year-old boy and a woman in her twenties are rescued from the rubble of a building that collapsed in the devastating earthquake which struck Nepal. 'I survived by eating butter' Jump to media player A 15-year-old boy rescued from the rubble of Nepal's earthquake, says he survived because he found two containers of butter nearby. Nepal earthquake: Anger at aid delay Jump to media player The UN has launched a $415m (£270m) appeal for those affected by Nepal's earthquake, as frustration mounts at the pace of relief efforts. Aid yet to arrive in Nepal village Jump to media player A BBC team in a district north of Kathmandu, Nepal, find no evidence of aid arriving days after the earthquake. Drones help aid relief in Nepal Jump to media player Unmanned aerial vehicles are being used to help aid relief in Nepal. Survivors tell of devastating quake Jump to media player Emergency aid begins to reach remote Nepalese communities as the search and rescue efforts continue. A 15-year-old boy has been pulled alive from the rubble of a building in Kathmandu - five days after the earthquake which hit Nepal. The BBC's Yogita Limaye was with the rescue team when they found the teenager.